for the polis made sure we did sweet bugger a'. For tenement livin' was a bloody disgrace. From the alternative memories the conditions were often deplorable yet this song typifies the feelings that were prevalent when the letter arrived informing the family that they had to move as the building was being demolished. We ALL wanted to stay! 1. 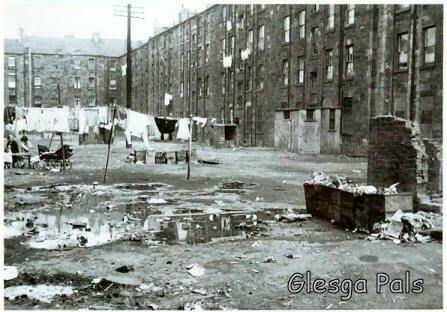 Noo A’hm a workin gent Ah live in a tenement, in the heart o' one o' Glasgow’s biggest slums. But we do not want tae go and we daily tell them so, while they’re pullin doon the buildin next tae oors. But we’re happy where we are, think we’re better aff by far, wi a pub on every corner of the street. But we do not want tae go and we’ll daily tell them so, while they’re pullin doon the buidin facin oors.